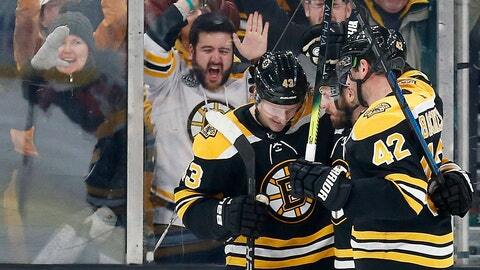 BOSTON (AP) — The points — and comebacks — keep coming for the Boston Bruins. This was Boston’s third come-from-behind victory this week. Brad Marchand and Chris Wagner also scored for the Bruins, who improved to 15-0-4 in their last 19 to establish the second-longest points streak in franchise history — the 1940-41 club holds the team mark with 15 wins and eight ties over a 23-game run. Boston trailed by two in Tuesday’s 4-3 overtime win against Carolina before falling into the same hole in Thursday’s 4-3 win over Florida. Ottawa led by a goal early in the third before Wagner’s tying goal set up Krejci’s winner. Marchand beat Anderson on a power-play with a one-timer from the right circle off Torey Krug’s cross-ice feed to give Boston a 1-0 lead with 9:49 left. Tkachuk swooped in to bury a rebound after Rask stopped Chris Tierney’s initial offering at 2:46 of the third to put the Senators ahead 2-1. Wagner tied it for the Bruins on a 4-on-4 after winning a battle in the slot and re-directing Krug’s wrist shot past Anderson with 11:13 remaining. NOTES: The win marked the first time in Bruins’ history that the team scored a game-winning goal in the final minute of consecutive regulation games. Patrice Bergeron scored the winner with 7.2 seconds left against the Panthers. … Marchand extended his points streak to six games (four goals, six assists) and has 34 points (12 goals, 22 assists) in his last 23 games. … Ottawa is 0-7-1 in its last seven meetings with Boston. … Bruins LW Jake DeBrusk was sidelined a second straight game with a lower-body injury and will also sit Sunday against the Penguins. RW David Pastrnak (left thumb surgery), RW Marcus Johannson (lung contusion) and D Kevan Miller (upper body) won’t travel for Boston’s three-game road trip. … Senators LW Anthony Duclair (lower body) played after blocking a shot Thursday against the Islanders and missing Friday’s practice. D Christian Jaros (hamstring) missed his third straight game. … Boston D John Moore played his 500th NHL game. … Bruins RW Lee Stempniak was recalled from Providence of the AHL on an emergency basis. … A fire on the 25th floor of a nearby high-rise building under construction caused delays for fans entering TD Garden.